Bookings are taken on poolside over the last two weeks of each course. Please notify of any learning or physical disabilities and/or health issues upon initial booking. Jump Into Swimming Ltd will, where possible, rearrange your missed lesson as a gesture of goodwill. We do ask that you provide us with advanced notice so we have time to plan for the replacement lesson. One replacement lesson per family per term. The replacement lessons are subject to availability. If a customer needs to cancel the remainder of a course for medical reasons, then a written letter and a doctor’s note will be required, and a full refund will be issued. If a location is unfit for lessons, or has been closed, then lessons will be credited onto the next course. Parents will be notified of a pool closure as early as possible. If you do not wish to continue onto the next course a refund of one lesson will be issued. 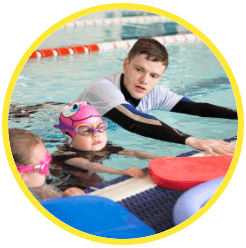 If a swimming instructor is absent and adequate cover cannot be provided then a lesson will be credited onto the next course. Parents will be notified of an absent instructor as early as possible. 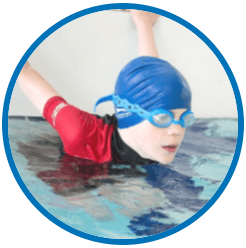 Jump Into Swimming is not responsible if a customer is unable to find the swimming pool, arrives late, or at the incorrect time for any lesson. Credits/refunds will be given in retrospective circumstances. Jump Into Swimming Ltd will adhere to the guidelines of the Data Protection Act 1998. 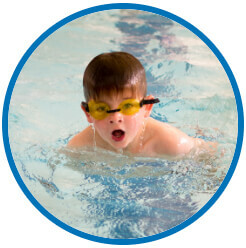 We may, in order to aid your child’s swimming, physically help your child to swim, jump in or climb out of the pool. This is in accordance with the Child Protection Act, if you would rather we didn’t do this please let us know prior to your child’s first lesson. 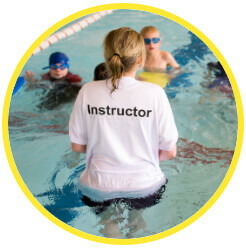 Please try and carry all belongings onto poolside whilst your child is having their lesson. Jump Into Swimming Ltd is not liable for any lost or stolen belongings. Please do not eat or drink on poolside. Please respect all facilities and adhere to their rules and regulations. Photography & Videography is strictly prohibited within any of our facilities without prior consent. Please contact us for more information on Photography.